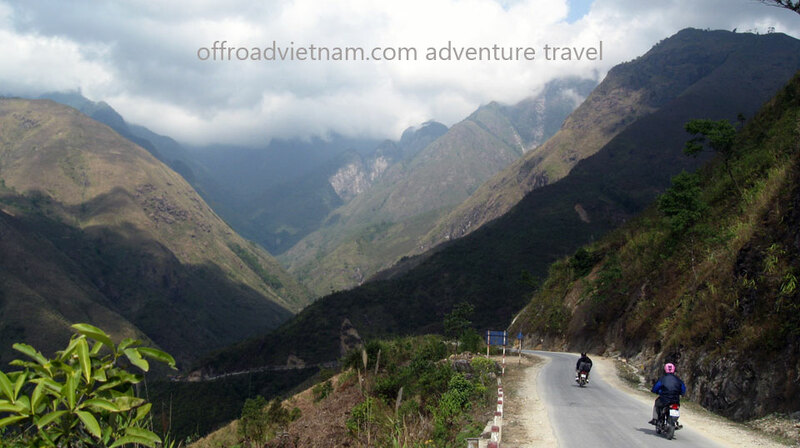 Northwest & Northeast Vietnam motorbiking in 11 days / 10 nights. The video below has some portions of this Northwest & Northeast Vietnam motorbiking in 11 days. In case you want to watch more videos of our Vietnam motorbike tours please check our YouTube channel. Today is the first day of this Northwest & Northeast Vietnam motorbiking in 11 days. Before starting to ride, we will have a short briefing to let you know about the rules. In addition, the guide will show you how to understand him by his body language. We start around 9.30am after the rush hours. Day 2: Mai Chau – Song Thao. ~180 km, ~8 h.
In general, you take in the beautiful landscape. Valley of wax-tree, the native land of lacquer makers in Vietnam. In fact, Song Thao is a very small village lost in the hills on the west bank of Black river. In particular, this is the place where we grow lacquer trees to collect the precious substance called lacquer. We are welcome in the house of our friends. You meet Kinh (ethnic Vietnamese). We propose to stay in the house of the two “uncles”, the direct descendant of the ancestor who discovered the property of this tree and the way to use it, about four hundred years ago (quite recently compared to China who knew about lacquer few thousands years ago). Day 3: Song Thao – Yen Binh – Vu Linh. ~100 km, ~3 h.
Ride from Song Thao to Vu Linh on asphalted road and dirt roads, then reach Thac Ba lake where a boat will be waiting for us. Then we will cruise on the lake from west to east, until the Dao village of Vu Linh. Honestly, the welcome is exceptional. Day 4: Vu Linh – Na Khan. ~250 km, ~9 h.
You ride from Vu Linh to Na Khan through Thai Nguyen (over 200 km). In general, the road is sealed all the way until Bac Kan. However, the last part from Bac Kan to Na Khan is wild and little bumpy. Na Khan is a Tay village, lost in the middle of the primitive forest. Mr. Lo, chief of the village will welcome us in his house. Day 5: Na Khan – Ba Be. ~50 km, ~2 h.
In fact, you only have a short ride from Na Khan to Ba Be on a bumpy road. We leave our bikes at our host’s house. Then an easy boating on the lake and river until the house of Mr. Pirate where we have a lunch. Afternoon, we can go to market (if it is the day you arrive), stop at a waterfall, have a swim etc. Down the waterfall, we could visit the village and a small school. We can stay in the stilt house of forest guards (next to Pirate’s house) or come back to the village and spend overnight with Mr. Dang and his family. Day 6: Ba Be – Quang Hoa. ~170 km, ~7 h.
In fact, it’s a beautiful ride up to Cao Bang province. Probably, it is the best riding day on this Northwest & Northeast Vietnam motorbiking in 11 days. There are few passes from where you can dominate the area. The road is easy but there are many curves. While riding we can stop a lot. Altogether, with stops for drinks and food, it should be an 8-hour journey. Then ride 1 more hour to reach the beautiful village of Quang Hoa, in the middle of a mountain cirque. This is the territory of Nung An people. Spend the night at our friend’s house. Day 8: Quang Hoa. ~100 km, ~2 h (or ~30 km, ~1 h). Day 8: Quang Hoa – An Chau. ~210 km, ~7 h.
Ride from Quang Hoa to An Chau. An Chau is an ecologic zone, 80 km from Lang Son, the road from the turning to An Chau is quite bumpy. We propose to stay overnight in a guesthouse in town. Day 9: An Chau – Bai Chay – Halong. ~80 km, ~3 h.
Ride to Bai Chay in 3 hours on the mountain road, passing many coal mines along the road. We hope you are not covered in coal dust when we arrive in Halong City. Promenade along the coast in Halong City. A boat is waiting to take us and our bikes to cruise in Halong Bay. Enjoy lunch with seafood on the boat. Boating to Thien Cung cave, fishing village and then through myriads of limestone to Ba Trai Dao (Three Peach Fruit Islet). Swimming and sleep here. Day 10: Halong – Cat Ba. Boating. Day 11: Cat Ba – Hai Phong – Hanoi. ~120 km, ~3 h + 2½ h ferry. Promenade in Cat Ba and ride to Cat Ba National park (18 km from town). Then take the ferry from Cat Ba to Hai Phong at 13.30 and takes 2 and half hours. Finally, ride on the nice asphalted road on Highway 5 to Hanoi. Contact us now to book this tour or to know about different itineraries and options of this Northwest & Northeast Vietnam motorbiking in 11 days.